And these lovely bits are from walking the dogs around the lake. Snow was unloading from branches the whole time – the dogs kept thinking I was throwing snowballs at them! We’re starting to get fired up for spring projects–it suddenly feels not so far away. We finished! The last light installation – finally! We were set to do it in the fall, but a series of work things and weather surprises kept us from installing this last porch light. Last weekend, we had an unseasonably warm day (a little over 40 degrees – heat wave! ), so we set up the ladder and got this light installed over the front steps. It made a huge difference – especially on these dark winter nights. Still to do: we need at least a week of 40 degree temps to caulk around the fixture, but that can wait until spring. We’re crossing this off the list anyways. Placement, and cutting the hole. It throws light on the whole flight of stairs! And makes a welcoming entry. Little jobs are on the docket this winter. 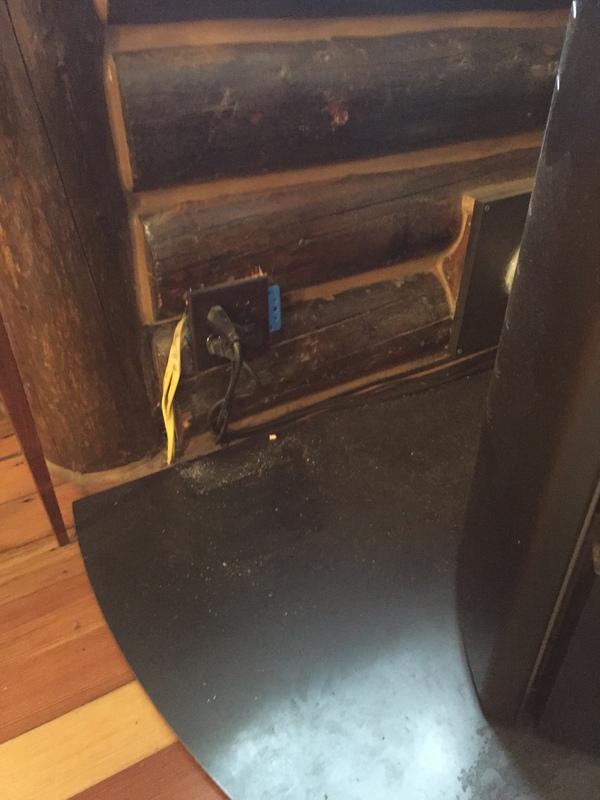 First, developing something to hide our last messy bit of infrastructure: a mess of cords and wiring that had to be in this location next to the pellet stove. Yes, it took me two years to think of an appealing, creative solution for this. Looked pretty good. Some log caulk will help hide the seams. But what to top it with? 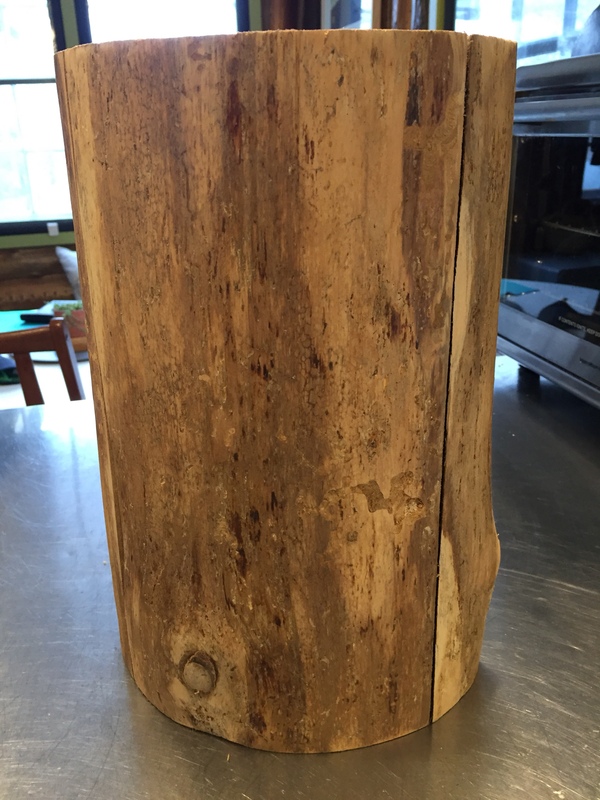 Pondered a stretched bit of leather (like a drum), a metal cap, or a wood top, and then I happened across someone selling log “cookies” for a couple bucks each – perfect. I grabbed two (I’m sure we’ll find a use for the second one!) and scribed it to fit the odd profile against the log wall. And here it is! 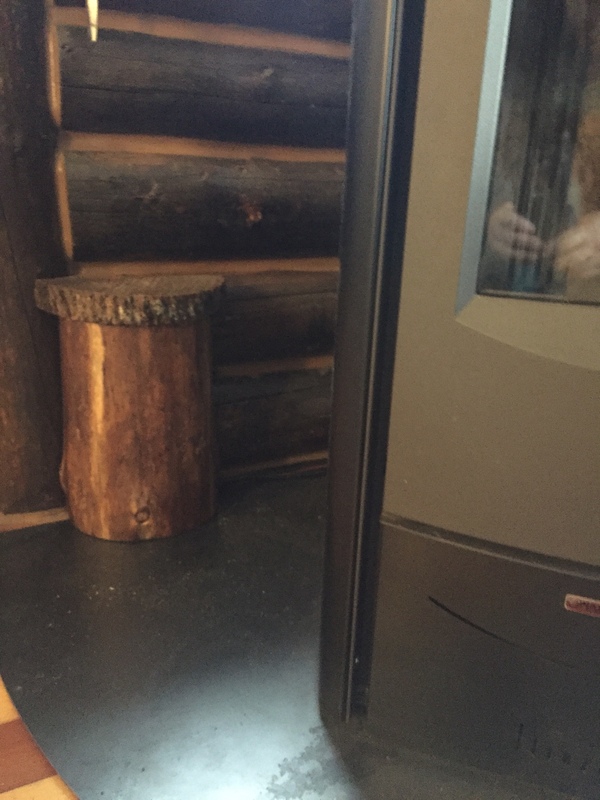 First unfinished, then stained so it blends in with the old log walls. One problem solved, a million to go. We like to have a quiet holiday at home. Quiet except for power tools, the nail gun, etc. This year’s project was smaller scale than last year’s (we built the whole loft! Jeez, industrious). We aimed to build a console-type unit behind the couch, sacrificing 4.5″ inches of floor space to hide the ladder, a bunch of infrastructure, and add an outlet with USB plugs behind the couch. In a funny twist, even though we built in 8 outlets on the living room wall, the couch covered nearly all of them! So we got this handy little extension, bought one new board, and set to work. Besides the two new items and some $3 hinges, we had everything else we needed in the scrap pile or as leftovers from previous projects. Two cool catches we purchased for another project last year but never used were put into service, and they worked really well. One and Two. We also (finally) added baseboards on all the white walls, so earrings can stop rolling under the walls. They really made the place look a good bit sharper too. FYI, mid-century style baseboard selections are fairly limited (either flat stock or something with a simple square bead profile), so we were stoked to find these in stock at the big box (though MDF is not a favorite material, everything else about it was right). Where are the studs again? Marking it out. The shelf is in! With outlet. A panel now hides the router, cords, wink unit, etc. And even better when trim surround is in. And we added baseboards, at last. Tight corners look pretty decent! Meanwhile, outside…snow and temps hovering around zero all week. Snow humps outside the bathroom window. And dogs with cabin fever. The punch list is getting shorter! But don’t worry, plenty left to do. And I still have some time off for break, so we’ll see what else we come up with. It’s Thanksgiving break, so we’re finally able to catch up on punch list items, and on this blog! First project was to finally build a headboard. We originally weren’t planning on having one, but a white-painted wall where our sometimes dirty hair rests is not a great idea (did we mention we work a lot, and are outside a lot, and have two dogs?). First, I measured and found it could be a nice standard dimension: 18″x48″. Off to the big box store for a 2’x4′ handy panel of 1/2″ plywood, and had them cut it to 18″ wide. I also successfully begged some scrap plywood in their cut pile, that another customer had left, to reinforce a garage shelf that I didn’t really want to have to pay to do. Yesss! Then, to the fabric store for foam padding (I used this stuff, NuFoam, to see how it holds up), batting (I used this stuff, Soft & Bright, which was really easy to work and simple looking in case the fabric I picked had any openwork), and fabric. There was a fabric sale, plus I had a coupon, plus I was shopping the clearance pile, so I picked up three options each 2′ long by 54-58″ wide. Each piece was $2-4, and one I didn’t use is going to become scarves. I ended up using the $2 remnant, of course. Next, We used these flush-mount hangers I had from a yard sale grab bag a few years ago. Somehow I both (a) knew I still had them, and (b) was able to find them right away! Here’s that dirty wall. We will repaint next summer anyways, but this will keep it from happening again. We measured and first attached the mounting brackets to the wall — we had a handy reference line because the wall is vertical v-groove — then attached them to the back of the headboard, which took a bit of trial and error. Only put one screw in each until you get the spacing right. And voila, done. It looks a little more lumpy along the top in this photo than in person, but it shows the fabric. I went in thinking “navy blue mid-century tweed” and was determined to stick to the clearance aisle; there was a lovely herringbone tweed that could have been used on Mad Men, but it was tan. All tan!!! This color worked perfectly and I love the dark tones in the tweed. Good enough! Supermodel Bisbee insists on being in the rest of the photos. Actually, she is really insisting on watching for chipmunks and barking noisily about them. Although I originally wanted to keep it really spare in the bedroom (it’s tiny! ), the addition of the headboard really improves the scale of the back wall overall. And it was really comfortable for reading! A good addition. Winter is coming – someday? We just had the warmest October on record and are about 5 weeks past our usual winterizing date. Which worked out great, because this fall K has decided to build custom storm window inserts instead of shrink-wrapping plastic directly to our freshly painted window casings. 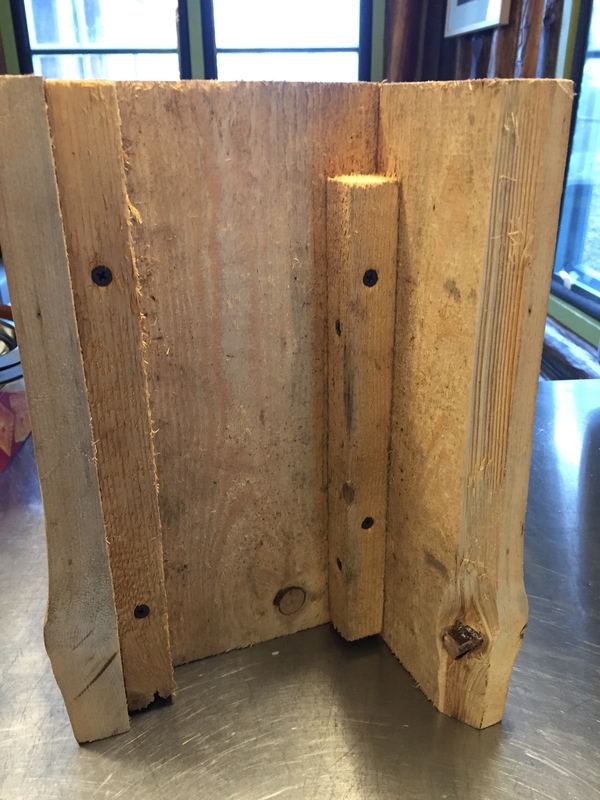 We used a method we developed at our previous house, but improved a few parts of the process. They end up costing about $12 per window, and are re-useable (we used the ones at the last house for about 7 years or so). They dramatically cut the drafts, and don’t look bad either. This set, since they are painted to match the sashes. are almost invisible in some rooms. First, he builds the frames from 1×2 pine, this time using our handy doweling jog (last time we did lap joints). He puts a center bar made from 1×1 across about halfway down – we originally skipped this at the other house but had lots of warping and some breakage. Then he painted each frame with the same paint as the sashes. Then, we put the tape that comes with the window shrink film all the way around one face, pressing well. Stick on the plastic and flip over, repeat. This size worked for most windows; we got some different sizes for the larger ones. There’s thicker plastic you can buy in a roll, but it doesn’t shrink – so it’s not as clear. We do a double-layer of film with an airspace between, so it’s not necessary to use the thick stuff. Then (and this is something we didn’t do at the other house but we did have a few inserts where the thin plastic tape peeled off), we used this more expensive tape (about $2/insert) and went around the outside edge of each window, folding down to capture the edges of the shrink film. Next, we stapled on two tabs (we use folded-over ribbon or cotton strapping – whatever we have saved up in the fabric-ends bin). These allow you to pull the insert out and adjust it too. Then the fun part – shrinking! Finally, cut 1/2″ inner diameter pipe insulation to bevel the corners, wrap around each edge by slipping it over the slit side, and press-fit the completed storm insert. Most of ours fit great with the screens still operable on top. Closing the screens hides nearly all of the insert, and they are quite clear when shrunk. We have already noticed a huge difference in draftiness, and condensation on our 90-year-old windows is much reduced. Hopefully we’ll use a few less bags of pellets this winter. We recently found out that someone fulfilled a request I posted online years ago: on a web site called Find a Grave, you can request photos of someone’s grave site. Way back then, I had found this Find a Grave site and it listed the cemetery where Carlotta (who was the original owner of our house) was buried. I went to the cemetery, walked all over, and couldn’t find her stone! So I posted a request for a photo of the grave on that site. About a month ago, someone happened to photograph her stone and post it, so we took the photo (which had a useful view of a fence in it) and went back to find her stone. And we found it! We’ve since found out that she died in 1930, just a few years after the cabin was built. We did a gravestone rubbing, which I haven’t done since I was a kid. It was behind a lovely tree hydrangea. This photo is wild – the hydrangea blew in the wind. Or it’s the upside-down. From the other side of the cemetery. There were some other quite old stones there, each with its own charm. Many small, old marbles – often with sayings on them – in this cemetery. Lovely marble, but the top was slightly knocked off axis. 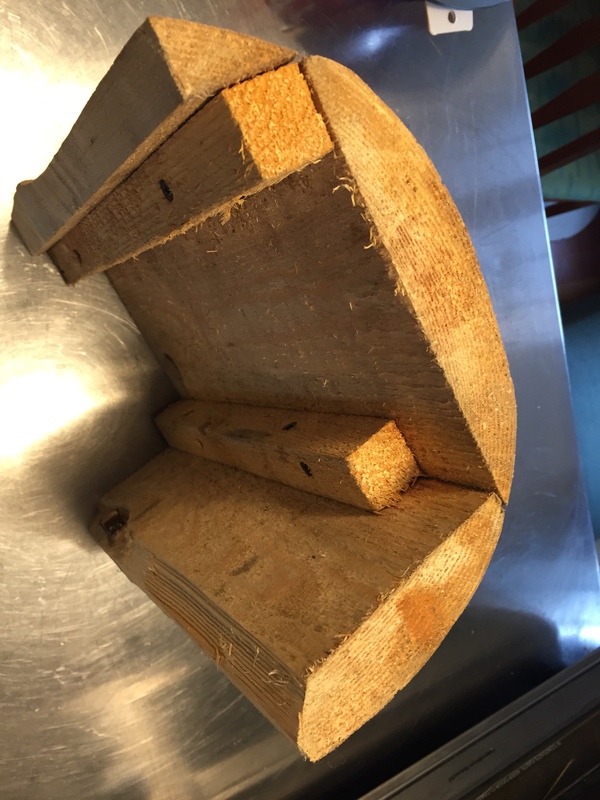 It was a good field trip, and we did a loop, stopping also to pick up some wood slabs (of course) and for a really great lunch at a place we’d never tried before in Searsport. Nice local business serving local food. So what if it’s fall already? Now is the best time to hit the nursery sales. And one area over our septic tank had fairly thin soil where nothing would take, so we rolled some rocks over and created one more raised bed. We put in some locally-raised junipers (var. 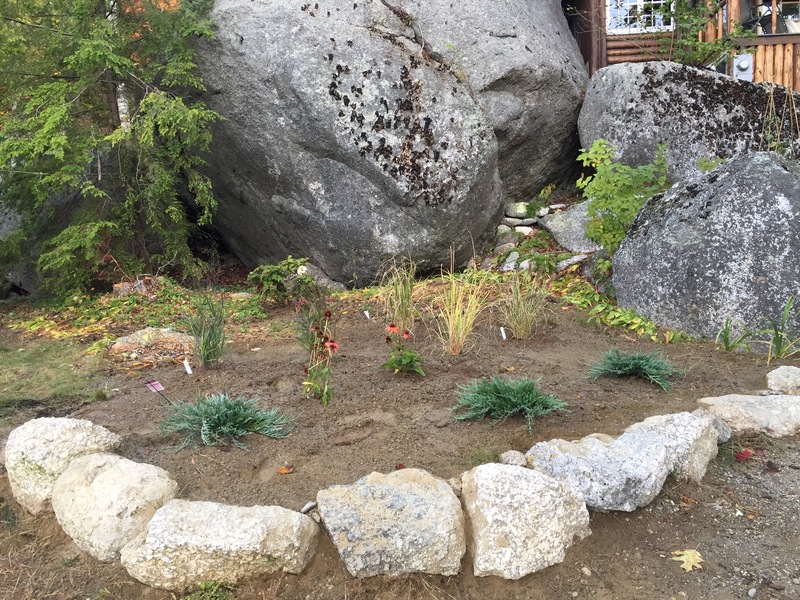 Bar Harbor), some nice perennial grasses, and some echinacea. In back is an oak-leaf hydrangea (Ruby Slippers), made possible by the new light regime with the maple gone. The yard is almost starting to look organized. More gardening in spring. We have been working on the porch like forever. It has been part of all the renovations since day 1 – first de-crapping it, making it sound enough to stand on, fixing the foundation, roofing, rebuilding the steps, putting up railings and posts, and decking. But when we looked up, it was still un-done. It still had a lot of red paint, a color we hope to never see again. Ah, the gross old days. Remeber all the stuff we cleaned out? Kind of looks worse than when we bought? Shutters were grimy but worth restoration. Cleaned up, a couple of years ago. Still some red! Starting to add a floor that wasn’t full of holes. 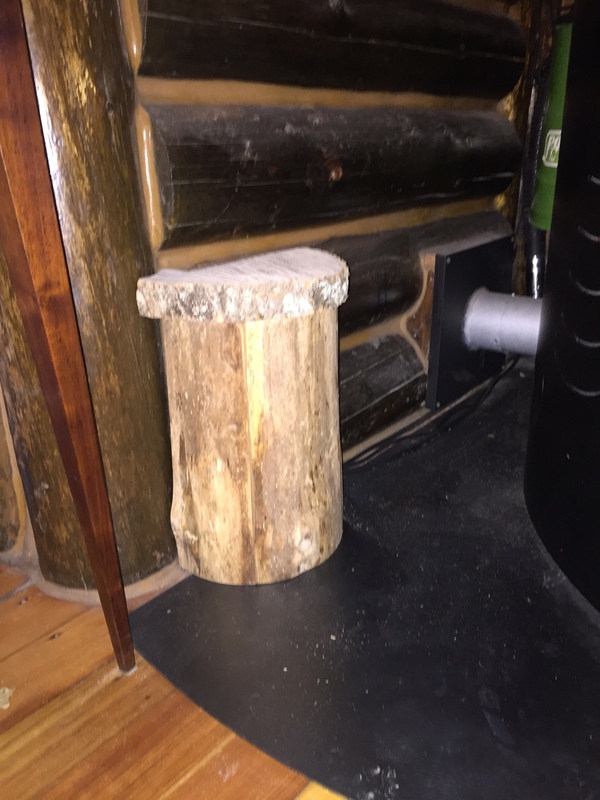 Crisp, clean, oakum-free logs with new stain and caulk. Because we saved the best (and least important structurally) for last: re-painting, re-staining, re-caulking, and re-trimming. Well, after many days on a variety of ladders, we finished! All that’s left to do is scrub off a couple of paint drops and put shutter dogs on the shutters. Oh, and restore two front-facing windows…next summer. And also install one last light fixture. Quick stuff!